Dear Michael, here are your liner notes. I wonder if you wanted me to write about Procol Harum, or this album, or music or Life or whatever. I know very little about this record, you know; I can't figure out from the dub, and what you told me, whether side two contains one, two or three works. Don't worry: I don't care. If I did, I could call Denny in England: no expense should be spared for the facts that matter. But this is not a matter of fact. This is just a record album. I am amused by how difficult it seems to have been for Keith to write the words for this album – no, not to write them, but to choose them – and I appreciate deeply his success in conveying his motley mood. This is a wonderful record, kind of a letter from a friend I guess, or an expression of an eight-month moment. I like it at the end, when Robbie simply says what he has to say, and it was so utterly relieving to hear him say it again. I like it at the beginning, when that familiar organ rolls/fades in and Keith/Gary starts by apologising. I like especially My Moonbeams and Shine On Brightly, which already run through my minds, and I like especially the whole show, as a whole show. Have you noticed how much the first Procol album (which was so influenced by Blonde on Blonde) influenced Music From Big Pink? This album here will affect so many of us so deeply that I wonder that you're not just bursting with pride at your involvement with it. I know I am. 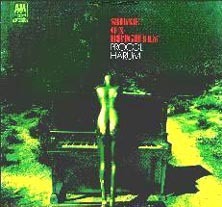 Procol Harum is a cornerstone of my existence, something I would have a craving need for were it not here. I am satisfied with this music; it really is fine stuff. You believe me, don't you? Good. I will stop repeating myself. Be very well – your friend Paul Williams. Who wrote which parts of In Held 'Twas in I?